Kenya is leading the way when it comes to digital innovation for financial inclusion in Africa, according to research by the Consultative Group to Assist the Poor (CGAP). Earlier this year, CGAP says it invited firms and organisations to submit proposals for digital innovations they believe have the most potential to advance financial inclusion in Africa. The results have now been released and it received nearly 200 proposals, with ideas ranging from blockchain ecosystems to new uses of satellite images and GPS functionalities. CGAP acknowledges that it does not paint a full picture, but believes it is an interesting sample that is worth sharing. We’d agree. 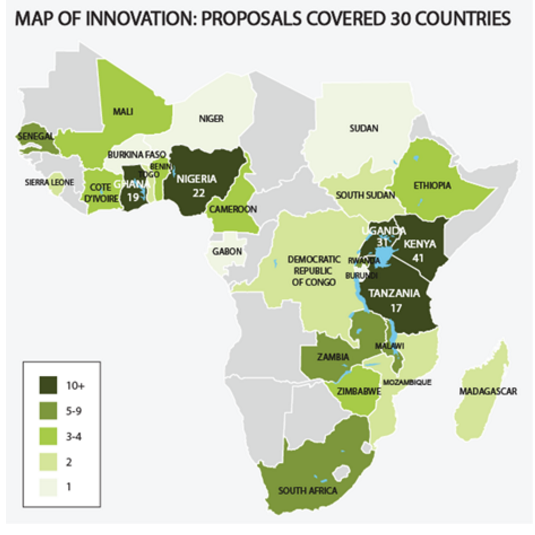 Fintech firms, including many start-ups, “seem to be driving innovation in Sub-Saharan Africa” as they submitted most of the proposals (56%), followed by financial services providers (18%), NGOs (13%) and technology services providers (9%). CGAP says while most people are served by traditional financial services providers, fintech companies are making the biggest push in innovations. However, “this is not to say that banks and microfinance institutions (MFIs) are not involved”. A large portion of fintech firms have business-to-business models and are partnering with banks and MFIs to bring new services to market. The highest number of proposals came from Kenya. CGAP says this is not surprising since Kenya’s mature mobile money ecosystem is a big enabler of innovations that use digital payments platforms. Other countries with developed mobile money markets, including Uganda, Nigeria, Ghana and Tanzania, followed Kenya. Beyond these, 25 other countries were represented, showing that innovations are spreading beyond the most active start-up hubs. About half of the applicants were looking to enhance or develop a general retail financial product for low-income people, without a more specific target user. The other half focused on tailoring products for a specific sector – micro, small and medium enterprises (19%) and farmers (18%) being the most popular. A smaller number of proposals linked financial products to health, energy, education and housing (12% combined). 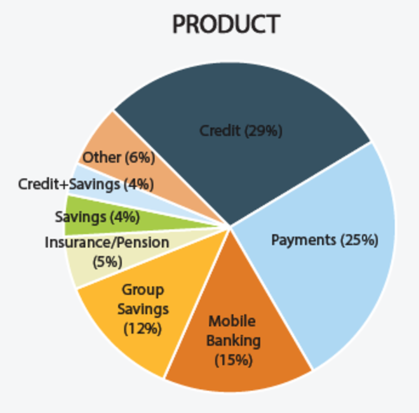 As for the type of product, credit was the most popular. According to CGAP, access to credit to meet liquidity gaps for irregular earners, to address financial shocks like a death in the family, or to increase future income through investments are some of the main financial challenges that poor people face. Payment solutions were also popular, as they are a necessary building block for other digital financial services like savings, credit and insurance. Since all the innovations used digital technology, CGAP also looked at the main digital attributes they planned to incorporate. The majority (115) used at least one of the seven attributes shown below. 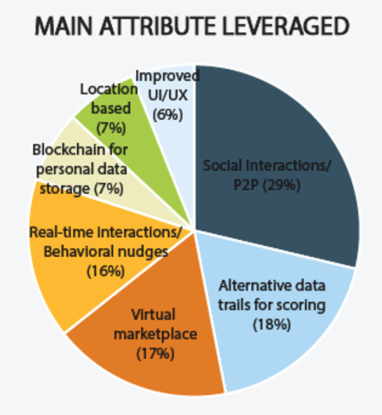 Organisations showed an “especially strong interest in leveraging social connections and person-to-person payments platforms as key components of their products (such as digitised group savings)”. Many proposals also focused on using alternative data trails for scoring. This is consistent with the increasing trend CGAP sees of providers looking to make more effective use of data. InvestED, a start-up that links edtech and fintech in Ghana, by offering educational videos and quizzes for microentrepreneurs. Kenya-based Apollo will test the ability of satellite images combined with land GPS locations to assess farmers’ loan repayment capacity and cashflow timing, with the goal of making it more cost-effective to lend to smallholders. Hover will introduce a mobile wallet app that is compatible with existing mobile money offers in Tanzania and capable of running on top of unstructured supplementary service data (USSD) without a data connection. BioLite, a social enterprise, in partnership with MFI Juhudi Kilimo, will test the effectiveness of credit underwriting based solely on the use of Entrepreneurial Finance Lab’s (EFL’s) psychometric scoring tool. It will help rural populations in Kenya who lack lending histories or formal income sources to finance biomass cook stoves and power sources. Social Lender, in partnership with Sterling Bank, will test how useful social reputation and social network guarantors can be in informing lending decisions for low-income customers in Nigeria. Tulaa, based in Kenya, will test a mobile wallet through which smallholder farmers can save and borrow toward the purchase of discounted agricultural inputs, such as fertilizers and seeds. Senegal-based MaTontine will test a digital tontine (an annuity shared by subscribers to a loan or common fund) that incorporates a credit scoring system to offer access to small loans and other financial services. Patasente, based in Uganda, will test an online supply chain financing platform. Through the platform, small businesses will be able to receive financing against approved purchase orders or invoices, while investors earn returns by guaranteeing or lending to small and growing enterprises. Peoples Pension Trust (PPT), a newly licensed pensions provider in Ghana, will test and develop tailor-made pension products for the informal economy. Thank you for the very useful information. How can I get the information about the methode and technology used in each of the innovation? Very interesting reading, how can i have access to CGAP updates with regards to innovation regularly. Four start-ups received $200,000 funding from DFS Lab, supported by Bill and Melinda Gates Foundation. Three African financial services start-ups have signed to use a cloud-based core banking platform from Berlin-based Mambu as their launch platform business.